The first Prime Minister of India was Jawaharlal Nehru of the Indian National Congress party, who was sworn-in on 15 August 1947, when India gained independence from the British. Serving until his death in May 1964, Nehru remains India’s longest-serving prime minister. As per the link https://en.wikipedia.org/wiki/List_of_Prime_Ministers_of_India .Since 1947, India has had fourteen Prime Ministers, fifteen including Gulzarilal Nanda who twice acted in the role.The first was Jawaharlal Nehru of the Indian National Congress party, who was sworn-in on 15 August 1947, when India gained independence from the British. Serving until his death in May 1964, Nehru remains India’s longest-serving prime minister. He was succeeded by fellow Congressman Lal Bahadur Shastri, whose 19-month term also ended in death. Indira Gandhi, Nehru’s daughter,succeeded Shastri in 1966 to become the country’s first woman premier.Eleven years later, she was voted out of power in favour of the Janata Party, whose leader Morarji Desai became the first non-Congress prime minister. After he resigned in 1979, his former deputy Charan Singh briefly held office until Indira Gandhi was voted back six months later. Indira Gandhi’s second stint as Prime Minister ended five years later on the morning of 31 October 1984, when she was gunned down by her own bodyguards. That evening,her son Rajiv Gandhi was sworn-in as India’s youngest premier, and the third from his family. Thus far, members of Nehru-Gandhi family have been Prime Minister for a total of 37 years and 303 days. From the chart above it can be seen that Saturn was aspecting the 8th Lord Jupiter Placed in the 8th house with Mars and a almost Degree-aspect on Mars . Saturn at 24 degree mark and Mars at 25 degree mark and 8th Lord Jupiter having Poorna ithasla with Sun Debilitated who is placed with Saturn. Poorna Ithasla of the 8th Lord Jupiter with Debilitated Sun in Trik Houses and the Results were seen. 3. See the placement of Mars at exact degrees on the Natal Jupiter 8th Lord in the 6th house at 25 degrees . 5. Ketu over the 5 planets in the Natal chart over the sign Cancer and Venus in affliction on the date , Now presently Rahu over the 5 Planets and again some changes in the Political Scenario and for some same results are expected. 1. Saturn is in Libra at the same degrees in Libra 24.06 at the time of Assasination of Indira Gandhi, but Retrograde and with Rahu. 2.Mars at 15.11 degrees in Virgo aspecting the 8th Lord Jupiter in the 8th house in Sagitarius at exact degrees 15.07 and Mars at 25.05 in Sagitarius.at the time of 31st Oct. 1984 Assasination of Indira Gandhi. 3.Jupiter at 25.09 Degrees from Gemini as 8th Lord aspecting Mars in Sagitarius at the same degrees 25.05 at the time of Assasination of Indira Gandhi on the 31st Oct.1984. 1. Saturn at 26-04 and Ketu at 27.58 in Sagitarius the 8th house over the Mars and Jupiter at the time of Assasination of Indira Gandhi on the 31st Oct. 1984 Mars was 25.05 and Jupiter 15.07. 2.Jupiter in the 8th house as the 8th Lord with Saturn, Ketu conjunction. Jupiter is also in Gandantha and stationary hence in most malefic condition. 3. These 3 Planets at the time of Elections in the 8th house are aspected by Saturn from Libra at 24.06 degrees at the time of Indira Gandhi Assasination and also Congress defeat and Narendra Modi win Degree-wise on Saturn, and Ketu along with 8th house and 8th Lord Jupiter in malefic condition. 7. At the time of Elections in April 2019 the dasha in operation will be Moon-Jupiter-Venus and we know at the time of Assasination the dasha was Ketu-Moon-Jupiter . 8. Sun and Saturn poorna ithasla yoga inimical one see the degrees of Sun25.50 and Saturn26.04 in the 8th house . On this basis I have arrived at this date of Election. Since in the Initial Chart of the Congress of 28th Dec. 1885 the Sun and Saturn opposition at 15 degrees and Saturn very close to earth then. It has been observed from the above that when ever Saturn is close to earth and also afflictes the Sun the Congress Party suffers since it has a bhandan yoga . From the above we can make out that the Parameters at the time of Elections in April 2019 are most Venomous for the Nehru Dynastic Politics . The afflictions are similiar at the time of Indira Gandhi assasination, Rajiv Gandhi stepping down and Congress defeat at the time of May 2014 when Narendra Modi came in Power. 1. Lagna has Moon and Mars at 29.59 and aspects the 8th house where Saturn almost Stationary Retrograde at 26.20 conjunct Ketu 25.20 in close degrees and forming inauspicious yoga. 2. Mars and 8th Lord Jupiter are samsaptak and same degrees aspect at 29.59 degrees and 8th Lord is also Fallen , in Gandantha and Retrograde and most malefic parameter at the time of Results . It also shows a Risk for the Head of the Country due to some espionage by foreign elements . The affliction to the 8th house and 8th Lord is most malefic parameter for the Nehru Dynastic Politics. 3. Saturn in Libra at 24.06 at the time of the 2 events when Indira Gandhi was assassinated and Congress fall aspects the Saturn in the 8th house almost degree-wise and coming close to the 24 degree mark on the 14th June 2019 may prove most Venomous for Congress Dynastic Politics it so seems. Jupiter is the Lord of the Lagna and the 10th house and Venus the Lord of the 3rd and the 8th house and Placed in the 10th house with Sun and is Combusted . In the Dashamasha Chart this Venus is Placed in the Lagna of the Dashamsha Chart D10 is crystal clear of the Venus giving malefic Results since Combusted and the 8th Lord of the Rashi chart. Around the Elections this Venus will be Exhalted and in the Lagna of the Rashi Chart and the Maha Dasha Lord will be fallen and placed in the 9th house and this Fallen Jupiter will aspect Venus in the Lagna making it extremely weak . 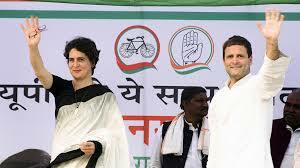 Transit Saturn over the natal Sun and Venusis indicating drastic changes in the Congress and Priyanka has been induced in the Party as the General Sercetary of AICC. Role Of Anter Dasha Venus in Transit with Jupiter in the 9th house . Around the Elections and the Results when they will be declared the Dasha in operation will be Jupiter-Venus-Mercury from the 1st March 2019 to 17-7-2019. It was the Anter dasha of Jupiter-Mercury in 2014 when Congress had a downfall in the Political Scenario of the Country . Mercury is ill Placed from the 8th house and the 8th Lord Venus for Longevity and also ill placed from the 10th house and the 10th Lord Jupiter . In the Dashamsha Chart Mercury is also in the Ascendant with Venus the 8thLord of the Rashi Chart and afflicted badly. The Transit of Ketu over this 10th house over the Conjunction of Sun and Venus may prove Venomous for the Party it so seems and specially the Scams may be unearthed. The Progression chart shows that In the Month of Jan. 2019 when there will be Degree conjunction of Jupiter and Venus Priyasnka will be induced from the Family 2nd House Jupiter Placement and Venus in the 10th house , Jupiter is also 8th Lord and a change but not for Good .Venus here is the Lagna Lord and the Mool Trikona Sign is in the 6th , hence Priyanka has been induced for Competitions which may not prove fruitful and the party may face music in the coming times. The Dasha Lords of Priyanka Venus and Saturn are in Rudda yoga in the Progression chart of Congress and ill placed from the Luminaries who are also afflicted . Saturn is yoga Karka for this chart and connected to Venus the Lagna Lord and the 6th Lord who has the aspect of Jupiter the 8th Lord . The Transit Jupiter after being Fallen after 23rd April 2019 in the 7th house will aspect the Lagna , it will first go in the 8th house in Sagitarius on the 29th March and then fall back on the 23rd April 2019 . This Time Frame will be most Venomous for the Congres Party and Priyanka Gandhi. It seems that till April 2019 there may be some gains but nothing phenominal to reach a higher pedestal in the Politics, they may continue to be in the opposition. This is not my Personal Opinion and is purely Astrological Prediction. ← Can Astrology Depict Amazing Things About The Querist’s On First Call In Just 2-4 Minutes ?